William Ritter’s highly entertaining fantasy novel „Jackaby“ has been one of my favorite reads in 2015 – not only because of the interesting crime case that was full of supernatural elements but also because it introduced two remarkable and very likable characters: the weird Mr. Jackaby, detective with a special focus on investigating unexplained phenomena, and his new assistant, the adventurous Abigail Rook who left her family in Great Britain behind and came to New England to follow in her father’s footsteps and become an explorer. In the sequel „Beastly Bones“ they now both have to investigate another mysterious series of inexplicable deaths even though there new case seems to begin rather boringly first when it’s all about some little shape-shifting kittens that have gotten out of control while Abigail would give everything to take a trip to the neighboring village and take a look at the dinosaur bones that have surprisingly been unearthed on a farm. I’ve been fond of Abigail right from the beginning of the first Jackaby book but this was the point where I could definitely and totally relate to her because what can be more exciting than DINOSAUR BONES? I almost became angry at Jackaby in the first chapters because he seemed to be completely ignoring his partner’s excitement for the dig site and kept intending on solving the shape-shifter case instead – seriously, who cares about some paranormal KITTENS when their are DINOSAUR BONES right next door? Thankfully Abigail (and I^^) soon got unexpected help from policeman Charlie Cane (who already appeared in the first book) who requested Jackaby’s and Abigail’s help in investigating the mysterious death of the farmer’s wife and the robbery at the dig site. 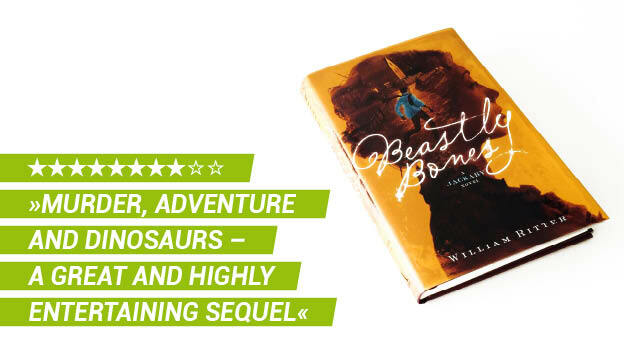 To be honest the story in „Beastly Bones“ isn’t very sophisticated since the book is so short that it hardly provides enough room for a complex plot to evolve but who cares when almost the whole story is set on a place with DINOSAUR BONES (excuse me, but I’m still excited about this^^)? But even though the plot was rather simple I once again had so much fun reading this because for one thing I absolutely loved the setting of this book and for another thing because it was again very entertaining to see Jackaby and Abigail at work. 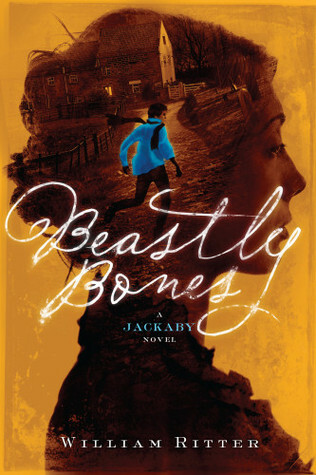 Comparing „Beastly Bones“ to „Jackaby“ I would say that the focus was much more on Abigail this time which on the one hand was great because she’s such a strong character who couldn’t care less about how 19th century’s society expects her to behave as a woman and rather pursues her dream to become an explorer and live a life full of adventure. If you like exactly these traits about Abigail then you probably will be happy to see that she gets backup by another strong and witty female character, journalist Nellie Fuller, who is (almost) just as awesome as Jackaby’s brisk assistant. But despite liking these two heroines a lot I can’t deny that I sometimes felt that there was too little Jackaby in this story and that I occasionally missed his and Abigail’s constant teasing. I also had the impression that „Beastly Bones“ had less „Sherlock moments“ than the first book and I would have loved if the investigation had had a bit more depth and actual sleuthing. Nonetheless I really liked reading this sequel and enjoyed it just as much as „Jackaby“ even though a few things were a bit different. Despite the case having turned out to be less complex than the first one it was still entertaining and even quite emotional in the end and I also liked how William Ritter left a few questions unanswered to already drive his readers curious about the third book – I wouldn’t exactly call the ending a cliffhanger but it definitely made me want to jump into the next part right away. So if you already enjoyed „Jackaby“ then I’m sure you’ll also have a lot of fun with the sequel because the characters are just as adorable as in the first book and it has the same great humor and the same charming weirdness that made „Jackaby“ so unique. I can understand if one criticizes that the mystery was a bit too simple but for me the dinosaur part totally made up for it. „Beastly Bones“ is a great sequel to William Ritter’s „Jackaby“ that again comes with very lovable characters, the same amusing weirdness as in the first book and a rather simple but nonetheless highly entertaining mystery that provides a lot of fun – especially if you’re just as excited about dinosaurs as Abigail Rook is.